DID PARIS-BREST-PARIS 2011 LIVE UP TO MY EXPECTATIONS? I really thought I needed to put some of my thoughts and memories of PBP2011 down on paper to remind me in future years of how it felt soon after finishing it and, maybe, to be of use for anyone considering riding PBP in the future (hello future, do we have hoverbikes yet?). Much of the ride is a blur of riding, not sleeping enough and eating, and, to be honest, I didn't want to write another ride report reading “rode for three hours, stopped at the control and ate some food, set off again and rode for another three hours, stopped at the control........”. I had decided to ride PBP for sure after my 400km qualifier – it was my first season of audax, I'd been aiming to ride a 200km every month following my lung difficulties and operation – I thought 200km each month was a good way to keep fit. I even thought I might try a 300km ride some time in summer. Well, by March I was riding 300km events, May was my 400km and, by then, I had some concept of what riding 1200km in one event might be like. I read blogs, ride reports, forums obsessively, trying to soak up as much as I could about what PBP could be like. Some of it really worried me, especially coupled with some challenges on my qualifiers. I kept reading of people knocking off 200km every weekend, and I was even more concerned about whether I was fit enough for this challenge. In the end, I rode around without incident or too much discomfort (see below) and ended up finishing the event in 76hrs, which I think is quite respectable really. So, did the event live up to the expectations I had in my head? With over 60 countries represented, it certainly has a huge portion of the world represented. The French dominate, with a couple of thousand riders (you could always spot a French rider – mainly on carbon race bikes with a saddle bag the size of an apple. Many French riders were totally supported by friends/family meeting them at every control in their camper van with some hot food, a comfy chair and a change of clothes. Nice way to do PBP – whether it's in the true spirit of long-distance riding is a contentious issue!). Not at all – though I had spent a small fortune on building up my new machine primarily for PBP, it was pleasing to see a very broad spectrum of bikes – from the afore-mentioned carbon bling to heavier steel bikes, with mudguards and Carradice saddlebags (the Brits!). There was then the more exotic, weird and wonderful – plenty of recumbents, tandems etc. and then the crazy fully-faired HPVs. Few were more weird and wonderful than Drew Buck on his 110 year old bike with single speed gear (that didn't work every time! 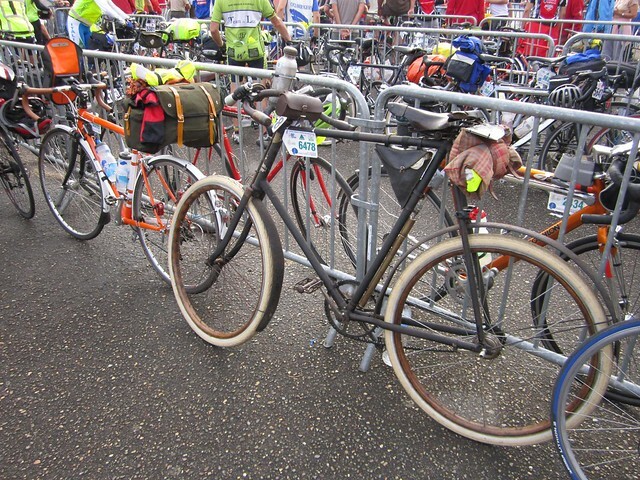 ), coaster brake, far too large for him and weighing around the same as a family car. I saw him several times on the trip, but most terrifying was catching up with him on the big descent of the ride on La Roc Trevezel. Sure, there's still quite a lot of kudos in finishing with the quickest time (it's not a race these days) and the four chaps who finished first this year did it in 44hrs and 12mins. A lot of people obsess about the planning for PBP with spreadsheets to calculate their expected arriving/leaving times at controls etc. I had a quick look at a spreadsheet – worked out that a moving average of 20kph meant 60 hours in the saddle, 30 hours off – sounded easy, so I left my planning at 'ride a bit quicker than 20kph and don't stop for more than 30 hours'! It's a question of balance – some people will be very fast, but like to have a good sleep (I finished the ride with a chap who'd had two nights in a hotel on the way around, with six hours sleep each night! ), other people will be slow and steady, but are able to deal with sleep deprivation better than others. In the end, my moving average was 22.75 kph – rather more than I expected, but, as we'll see below, there are reasons for that! I'd ridden large events at night before – mainly the Dunwich Dynamo, a 180km trip from London to the Suffolk coast which happens every year at night. I thought I'd seen a trail of red lights going as far as the eye can see. Nothing compared to the first night of PBP! I rode in the 90 hour group (so 90 hour was the absolute maximum time you had to complete the ride) – they released groups of around 4-500 riders every 20 minutes starting at 6pm on the Sunday night. I left in the very last group of 90 hour riders at 8pm – so we were about the last people on the road that night (a few people opted for the free-start where you could set off any time you wanted after 9pm). The first leg of PBP was a bit hairy at times – a lot of nerves and adrenalin flowing – people taking some real crazy risks as if saving 10 seconds now would ensure they would finish in time. But, once it started to stretch out a bit, I will never forget some of the sights of that first leg – it's a hilly section and there were several times where we were up high and could see a red line truly stretching all the way to the horizon. Amazing. I had read much on this. Most people agree that PBP is make or break with controls – if you can get through controls quickly, don't faff about etc., then you'll be fine. Hang around chatting etc. and you can start to get yourself in trouble time wise. However, with at least 3000 riders on the road ahead of us, I feared the worst for controls – and certainly my first stop (not technically a control on the way out) at 140km at Mortagne-Au-Perch really brought that fear home to roost. I just wanted a sandwich and a drink and the queue took about 20 minutes. This was worrying me. My next controls were a bit better – I also learnt to take the quick option – many controls sell baguettes and the queues were much shorter than that for hot food. By around 300km, it appeared to me that I was actually getting ahead of most of the riders in my time band – I'd ridden my fastest ever 300km (about 14.5hrs) and was now experiencing very few queues. This continued all the way around from here on – I never once queued for more than 5-10 minutes for a hot meal. Both sleep stops I had, there was no queue for a bed at all. I know that my experience is completely different to those that are closer to the 90 hour time limit, and I have already read reports of queuing for 45 mins for a bed etc. I am not a fast rider in reality and my one really big piece of advice to anyone considering riding PBP would be to just get that little bit faster and try and ride at least an 80-85 hour PBP and you will be towards the front of 'bulge' of the riders and the queues will be less. I had read that some people found the route a bit dull. I think the big difference for UK riders is that we can't cope with countryside and fields that just go on and on for miles. We live on such a crowded island (particularly those of us in the south east), whereas France is so sparsely populated. I did not find the route dull at all – there were some beautiful villages and the terrain had enough lumps and bumps along the way to make it interesting (see below on lumps and bumps). In the UK, even my close friends have no idea why you'd want to ride a bike 300km or whatever – the response I usually get is 'You're mad!'. Some people can't see why you are not riding for charity, as that is the only reason why you'd ride a bike a long way. But the French, well, they just get it. They are so passionate about this ride and their support and enthusiasm is really what makes PBP special. I've ridden in France several times before and had the odd person shouting 'Allez, allez, allez!' or 'Bon courage' at me from the side of the road or from their car. But PBP is something else – EVERYWHERE we went, there were people sat outside their houses wishing us all the best for the ride. Day and night – riding through villages at three in the morning and being clapped was really, really amazing. At many of the controls, there were huge crowds cheering and clapping – it all made you realise that you were part of something really big, that the French love and, rather than thinking you're mad, they think you are a hero (which, without wishing to sound arrogant, I guess we are really!). Many people went above and beyond simply clapping and cheering and had tables set up outside their house where they would fill your water bottles, give you cake that they'd baked. 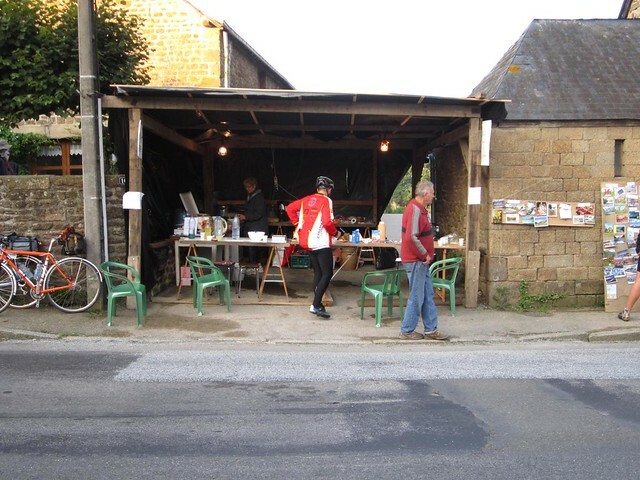 There are places on route that are well known amongst people who've ridden it before – there's a chap who's a real legend – he spends the whole event serving endless coffee, cakes, crepes to tired riders – and all he asks is that you send him a postcard when you get home. He even opens up a barn for people to sleep in the hay – truly brilliant! I actually got quite emotional on the second night when I finally twigged the whole 'they don't think I'm mad, they actually respect what I am doing' thing. They may not have thought I was a hero as I rode along laughing and crying to myself for a good few km! Blimey, there was much heated discussion on this. So, there's somewhere between 10 and 13000 metres of climbing on the route depending on who you believe – my figure was around 12000m. That's quite a bit of climbing – but, it's over 1200km and the majority of it is hardly what you can call steep. Much of it you'd hardly notice you were climbing, it just rolled along gently for the whole route. The 'big' climb is Roc De Trevezel – it's only around 400m high, and, again, it is a fairly gentle ascent. The only really bumpy, steep bits that stick in my memory were in the first and, therefore, last 200km – there were some reasonably steep climbs. Again, they were not silly steep like we get in the UK, but they certainly tested the legs, particularly on the way home! I don't think I ever used my granny ring, so my bottom gear would be 36*28. I wouldn't call it hilly, more rolling – though, do remember that I like climbing and it's one of the few areas of cycling where weighing 60kg is a real advantage! I'd read articles on some of the lasting effects of PBP on your body. I had experienced a numb hand after my 400km that lasted 3-4 weeks, but here I was reading about genital numbness, hand numbness lasting months etc. The 400km worried me – suffering the numbness really had me concerned. As part of getting the new bike, I went and had a bike fitting (at the Bike Whisperer in Ealing) and this seems to have done the trick. I won't say I didn't suffer any discomfort – that wouldn't be true. But compared to many, I really didn't suffer too much. My left Achilles was my biggest challenge – I had a small twinge in it on the way into Brest, but then it went away, so I didn't worry about it. But, after about 1050km, it really started to give me some problems particularly when I climbed (did I mention the last 200km was quite lumpy?). All the way along, I had got into my head that a sub-75 hour time was possible – but the Achilles was going to put an end to that. I took some pain-killers and rubbed a little ibuprofen gel on it – but it still gave me some troubles climbing. A week on – it still hurts a little just riding into town on my fixed. Sure it'll get better. Many people had problems down in the saddle area – seeing a chap who couldn't sit on his saddle at all (he was sort of balanced on the nose) I asked him how long he'd been riding like that – he said 200km! Another thing I saw a lot of was people riding along twisted over one way or the other to ensure that no weight was put on the sore side. Luckily, I have never really suffered with saddle-sores or anything like that – but, obviously, 1200km is a long way, so I was concerned. In the end, no problems at all. I was meticulous in keeping things clean down there, used cream and re-applied every couple of controls. I changed shorts at each sleep point (491km and 841km). Overall, really pleased to get through PBP without too much pain. As a sad foot-note to this section, there was a fatal collision between an American rider and a truck on the first night. There are currently not many details on the chain of events – but it was terrible news to hear and everyone's thoughts were with the rider's family. Having ridden in France before (including Brittany last year), I knew that, on the whole, the roads were way better than what we have to endure back in the UK. However, there were some rough roads – they use a chip topping on some roads – this in itself is quite a poor-rolling and tiring surface to ride on. In some areas, the chip had worn away to expose a smoother surface below – but this was terribly bumpy to ride on and really was as bad as anything we have here in the UK. But, overall, much better surfaces and the drivers are, on the whole, incredibly considerate and very well-mannered towards cyclists. 2007 had apparently been about the worst weather on PBP for many decades. So, it couldn't repeat itself now could it? Even the night before we left, there was an enormous thunder storm in Paris – proper thunder and lightning. On the Sunday, before we left, it was incredibly warm – high 20s I would guess. But there was some humidity that gave the suggestion of rain. In the end, my ride was almost dry – I happened to arrive at St Nicholas Du Pelem (491km) at around 10pm on the Monday. There was no queue for beds, so it seemed a good place to stop as I was now very tired. I remember laying down on my mattress, with a buff over my eyes as an eye mask – then lots of flashing. I kept on wondering why people were taking photos of us, and how inconsiderate they were. I really couldn't work it out – and then my sleep-deprived brain started to work out that there was noise as well – really hard rain on the roof. By the time I woke up, the rain had stopped – I had been lucky – certainly compared to many riders who were now just arriving at the sleep stop drenched. Apparently, the 84 hour riders who left on Monday morning had really awful weather for the first day. Just goes to show when such a large ride is spread over such a huge distance, people's experiences can be very different! This is 100% true. I was worried about arriving in the middle of the night – would there be anyone to cheer us home? There was quite a crowd as we were finishing right at the end of the 80 hours event. 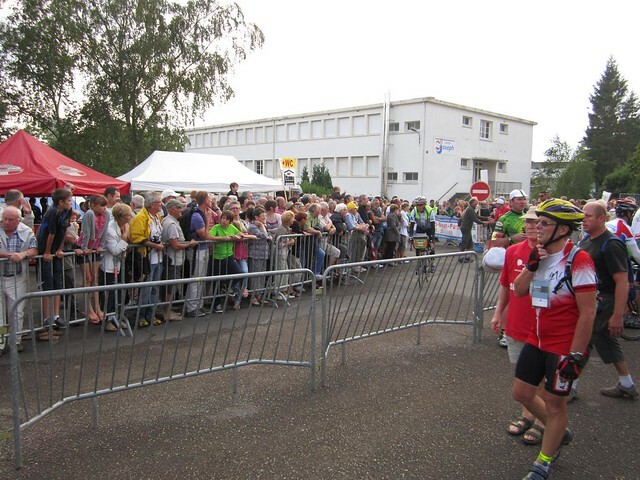 At the final control, Dreux, with 60km to go – it's easy to think 'I've finished' – but you've still got 3 hours of riding to go – that 3 hours felt like 3 days – I was so excited, bursting with pride already. Weirdly, I felt some disappointment – I'd gone over to Paris with the goal of finishing, but for all sorts of reasons, I had ridden quite a quick time and I'd thought the goal of 75 hours was realistic – it was still possible at Dreux, but I had to rest up for an bit and try and let my ankle recover a little. I kept telling myself, I had achieved all my goals just by finishing and the fact I'd missed out on the sub-75 hour finish was nothing to be upset about. Finishing is weird – firstly, you go to get your brevet card stamped, and they don't give it back! This little booklet that you've carried for the past 3 days as if it is the most precious thing in the world (and, to be honest, it is!). Secondly, all I'd done for the last 76 hours was ride my bike, stop and eat – and now, I didn't have to rush to eat and get back on the road. I felt a little lost almost. I finished around the same time as quite a few Brits, so we went to the food tent and ate a small meal, a few drinks and then bed! I hadn't expected to finish Wednesday night, so hadn't a hotel booked – but I would have slept anywhere to be honest. I managed to get 6 or so hours good sleep on the gymnasium floor. When I got up, it still hadn't really sunk in that I had completed such an amazing feat! I went and cheered people in for a couple of hours – it was really great to see people arriving in the daylight. The sense of relief on people's faces was great to see – there's a lot of emotion going on in that last km! This is totally true as well – I enjoyed every second of the ride. It was one of the most amazing things I have ever experienced. Not only had I managed to ride a huge distance in a reasonably fast time. There are many memories I will take away with me, most of them are to do with the people giving their time, appreciation and cake to us. I'll never forget the ride – some of it is already a little mangled in my mind, but then I guess 5 hours sleep in 76 hours of riding is always going to make things a little confused. I wondered whether PBP would be a once-in-a-lifetime experience – but I think it is not to be. I currently hope to ride again and make it a different experience – who knows how I will ride it though. Try for a really fast time? Try for a really relaxed ride? Fixed? Tandem? Who knows – I'll work it out in 2015. My biggest concern is whether I will enjoy any other 1000km plus rides? I had originally planned to ride London-Edinburgh-London in 2013 as my first long ride – I'll be 40 that year, so it seems like a good silly adventure. I now know it will be very different to PBP – the only roadside 'support' we tend to get in the UK is at closing time from the drunks – and often that's not all that supportive! Oh well – only one way to find out!